With all of the great home theater gear that’s available these days, it’s tempting to just buy the products that look the most appealing, take ‘em home, hook it all up, and enjoy the show. Unfortunately, purchasing the best home theater system to fit your particular needs is almost never that easy, and the process can be fraught with numerous pitfalls along the way. Luckily, most can be rectified, but some should simply be avoided altogether. Here are the Top 5 Pitfalls to Avoid When Buying a Home Theater System. It wasn’t long ago that any TV larger than 32 inches was considered a “Big Screen TV.” Nowadays, you’d be hard pressed to find a single home theater enthusiast shopping for a screen smaller than 40 inches. For the most part, that’s a very good thing: Nothing says Serious Home Theater better than a ginormous, room dominating LED or plasma screen TV staring you in the face. Just go out and find the biggest TV you can afford, right? Ah, if only it were that easy: You can in fact have too much or too little screen for your specific requirements. Too big, and you won’t be able to see the whole image on the screen; too little, and you’ll miss out on the immersive impact you were looking for in the first place. So then, how do you determine what screen size is right for you? A good rule of thumb is to use your viewing distance as a guide; this should measure out to at least 1.5 times the TV screen’s diagonal measurement. If you did this correctly, you’ll find you can purchase a surprisingly large screen for your distance. Let’s say you’re considering a 60-inch screen: 60 x 1.5 = 90 inches. 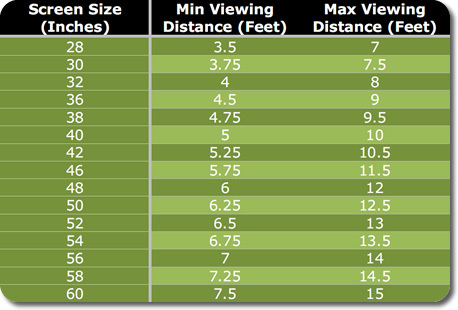 Divide by 12 to get your distance in feet: 90/12 = 7.5, which means you should be around 7.5 feet away from your 60-inch screen, but not much further than 14. Handy guides waxing poetically about this subject are all over the internet, but I’ve found the one shown here to be the most practical. The goal is to have the sound wrap around you like it does in a good theater, or set up a virtual soundstage in front of you when listening to music. Simply put, well-chosen speakers should sonically disappear into the room while flooding it with sound, even at lower volumes. In general, small floorstanders and stand-mounted (or “bookshelf size”) speakers will be perfect for small rooms and close distances; large towers will work best in large rooms and longer distances. Find a retailer or speaker company with a good return or exchange policy so you can make sure the speakers you’ve picked will work well in your room. When it comes to getting the most sonic bang for your buck, buying great speakers goes a long way, but driving them with a killer receiver comes a close second. 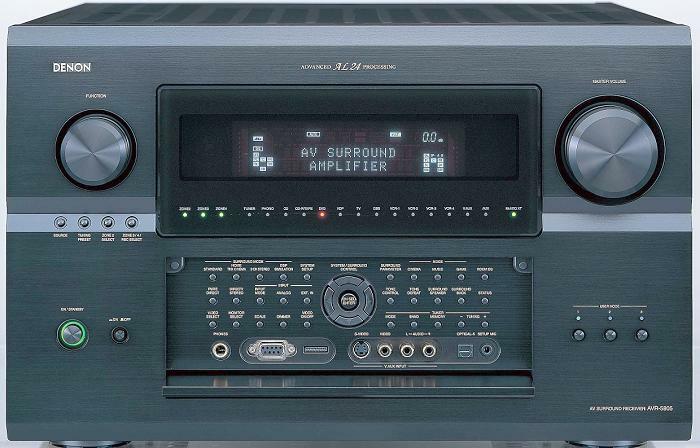 Unfortunately, many folks often underestimate the role an A/V receiver plays in coaxing the best sound from their speakers. Back in the ’80s, before home theater came along, it was hard enough trying to find a robust, high quality, two channel receiver for under $300 or so. And while features and technology are a heck of a lot cheaper these days, all of the critical amplifier performance and sound quality parts–things like power transformers, storage capacitors, and heatsinks–have only gotten more expensive. Now, add in 7.1, 9.1 , or even 15.1 channels of amplification, hi-res surround processing, multi-room operability, HDMI upconversion…add it all up, and it’s easy to see that manufacturers must make compromises somewhere–usually with smaller, lower performance transformers, caps, and heatsinks–so they can build full-featured receivers priced at lower prices. Of course, price isn’t always an indicator of quality, but it’s often a good starting point when it comes to A/V receivers. That old saying, “You get what you pay for,” holds truer here than it does for any other home theater component category. Generally, the models higher up in a manufacturer’s line won’t skimp on the sonically important components mentioned earlier, and they’ll be noticeably heftier as a result. Moreover, they’ll usually include discrete amplifier components and feature optimized circuit designs, both of which affect sound quality and power delivery for the better. Figure out what features you need now and for the foreseeable future, and then choose a receiver with the highest quality amplification you can afford. 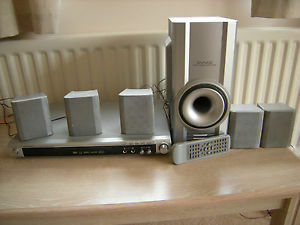 Your speakers (and ears!) will thank you. While one-stop shopping is a tantalizing prospect for all of us, a department home theater system takes a rather extreme approach to making something too cheap to be any good: Most of the A/V gear and Home Theater-in-a-Box (HTiB) systems sold here have performance quality as low as their price tags and feature a build quality to match. What’s more, they’re often devoid of many current features as well. If you’ve got your eye on an HTiB system that you can buy while getting your prescriptions filled or your hair cut, it’s probably best to steer well clear of that one. If you’ve read this far, you’ve done at least some research before purchasing or upgrading your home theater rig. Still, who among us can say they’ve never made an impulse buy? I know I’ve certainly made my share. But when it comes to audio and home theater gear–stuff you just might keep and cherish for years, if not a lifetime–figuring out the scope of what your available options are should be your first priority. No matter how small the purchase may seem—even if it’s a set of speaker stands or wall mounts—do your research before you buy: That’s what the interwebs are for. Visit equipment review and E-tailer websites to read professional and user reviews, find discussion forums related to your potential purchase, and browse manufacturer’s websites for the gear you’re interested in. Doing your homework eliminates any incompatibilities with gear in your current or future system, helps you decide what features you consider mandatory, and clarifies how much performance quality you’re after–all of which saves you from potentially wasting copious amounts of time and money. At the very least, it could get you thinking about specific features or design options you never knew you needed. If you remember only one piece of purchasing advice from this post, make sure it’s this one.